Chicago: Bean There . . . Done that? You can’t say that about a town like Chicago, can you? You’re never really done with it– too much to see, to do, to take in. Always changing, always jumping. Nope, “been there” maybe, but “done that” doesn’t cut it. This is the Chicago Bean. 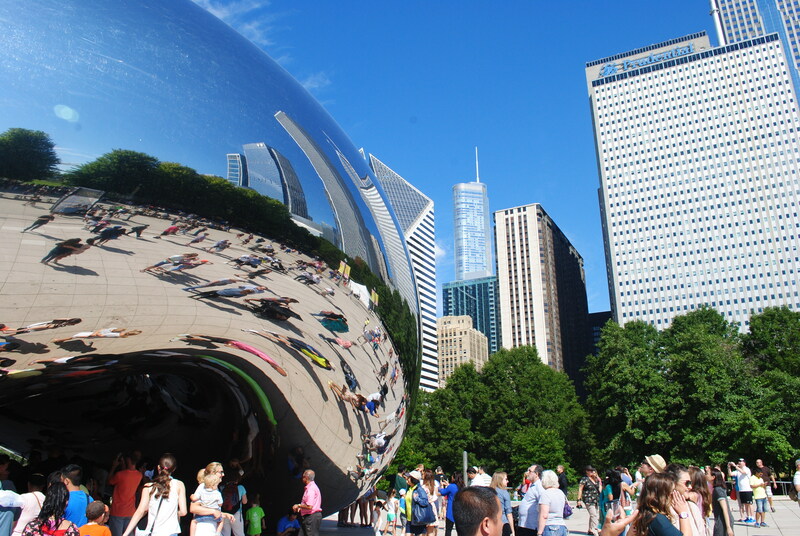 It’s fondly called the Bean, but really it’s Cloud Gate by artist Anish Kapoor. 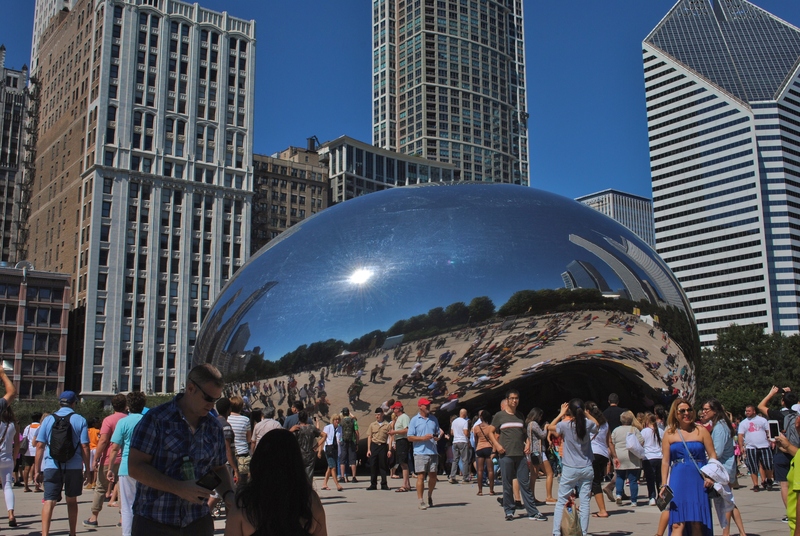 Dating to 2006, this sculpture stands in Millennium Park and is a crowd pleaser! It is visually stunning, but it’s also entertaining. The polished surface reflects the cityscape in a fabulous fish-eye way. And if that’s not interesting enough for all of us self-absorbed earthlings, it reflects us! 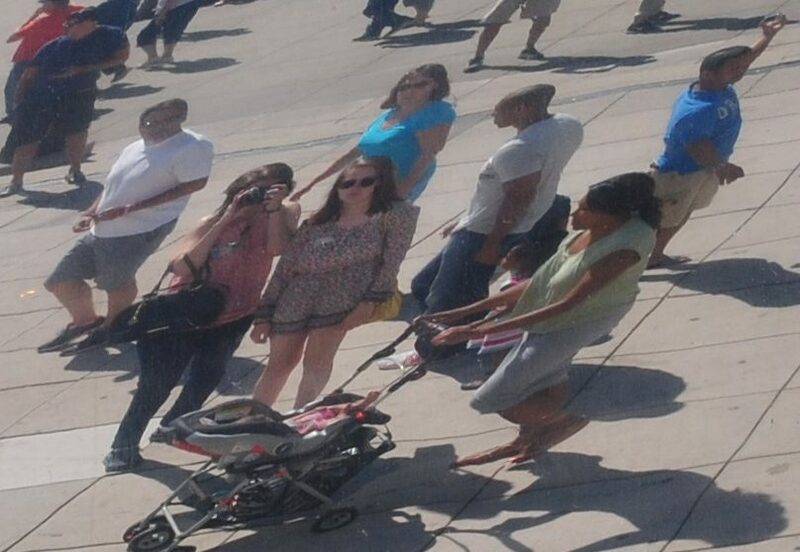 You can dance, goof around, and posture, and you are reflected in the bean. You can even take a picture of yourself taking a picture of yourself. More interesting, though, is the way it reflects the larger movements of the people, the community around it. 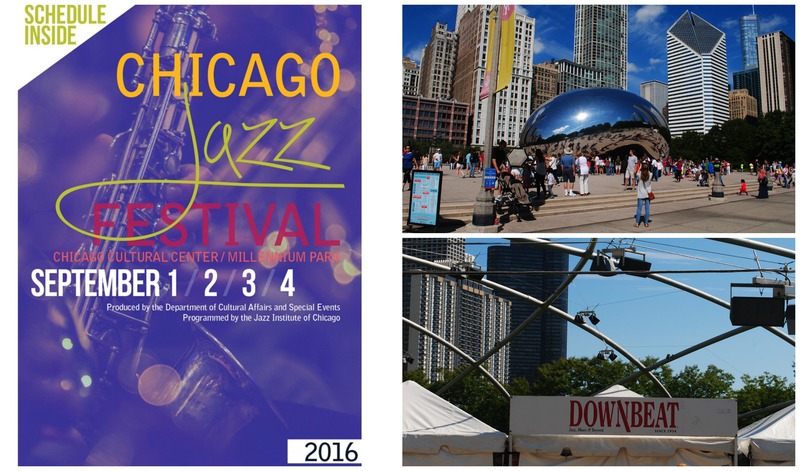 We were in Chicago this past weekend while a weekend long Jazz Fest was going on in Millennium Park, and the music and the constant movement provided a fascinating “urban dance” in the polished surface of the Bean. The people were a constant swirl, while the buildings stood static . . . but not so static. The Bean buildings vs the real buildings. One set swings with the jazz, the other stands tall and serious. Under the spell of the Bean and the jazz, the buildings looked like they were swaying with the music too. And why not– a sunny day in the park in Chicago will do that for you. 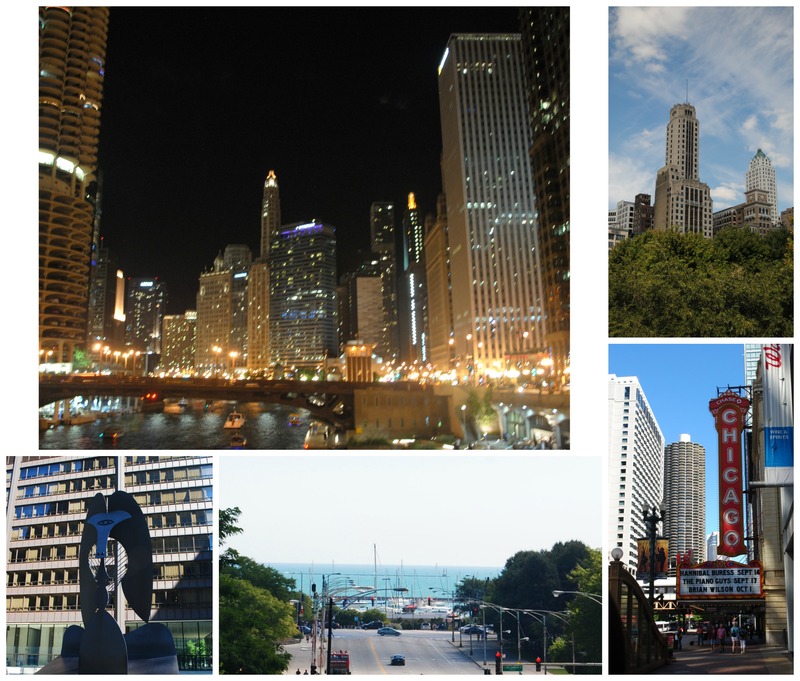 Our trip to Chicago was a spur of the moment thing– missing our travels and bracing for a possible hurricane in Florida, we decided to book a flight to Chicago and get the heck out of Dodge. A little impulsive; a lot fun. Chicago is a fantastic city. I lived there for about two and a half years in the early/mid 90’s, and I hadn’t been back since, so I was really excited about this trip. I’ll probably post more on Chicago in the weeks ahead, but here are some photos to whet your appetite. 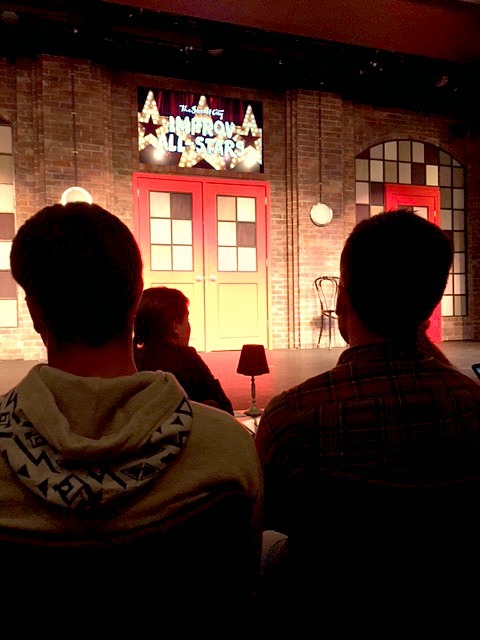 The improv stage at Second City–the first show we took in. More tidbits on Chicago in the weeks ahead. For now, so long, and all that jazz. . .
You definitely got “out of Dodge”. 😀 I’ve always enjoyed visiting Chicago…I’ve thought of it like a small NYC but friendlier. Chicago is my hometown. That said, I haven’t been there in almost 15 years. Some days I really miss the museums, the food, and the parks and zoos. They are some of the finest I’ve ever seen. But then I look around at my beautiful new hometown and realize I don’t miss the Chicago traffic or the crowds. Still, your post really brought on a fit of nostalgia. Crowds and traffic are easy to live without! We went out to Navy Pier on Monday–not factoring in the fact that it was Labor Day. The crowd was literally shoulder to shoulder, so we turned around and headed to Lincoln Park instead. That was the only frustration of the weekend, though. Chicago is a great city.